Samphires Restaurant in Llanelli, Carmarthenshire enjoys stunning panoramic views of the Gower Peninsula and Carmarthen Bay making it the perfect setting for a romantic meal, special celebration or simply an opportunity to unwind. Our highly skilled Executive Head Chef - Stephen Colling and his team ensure a range of dishes to suit all tastes. Food is sourced locally wherever possible to bring you the finest dishes using the freshest ingredients. 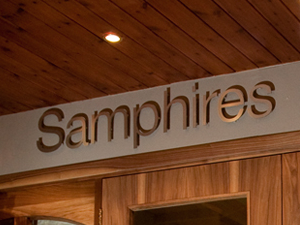 If you're looking for somewhere special for eating out in Llanelli then Samphires Restaurant is the perfect venue. Samphires is open daily - serving breakfast (Mon-Fri 7am - 9.30am, Sat/Sun 7am - 10am), lunch (12pm - 2pm daily) and dinner (7pm - 9.30pm daily) to our residents and the public.